Before I enter the Wrestlenomicon ring with a full slate of piledriving elder gods next month, it’s time for an appreciation of a game that’s all the way over on the opposite side of the kindness spectrum. The Tea Dragon Society, designed by Steve Ellis and Tyler Tinsley, is based on a super-sweet graphic novel by Katie O’Neill. Tea dragons are tiny pets that sprout magical tea from their horns. The tea carries memories, so players of the card game compete to acquire the most wonderful memories. Since it’s essentially a deck-building game, the memory cards do a lot less for you in play than the cards that help you keep your tea dragon fed, entertained, and well-groomed. The most clever thing about The Tea Dragon Society is that it’s a deck-building game with no hand. You’re not constantly discarding and shuffling cards. Instead, when you buy a non-victory card, you put it into play right away. Each card you draw stays in play in front of you until you spend the card, either to buy another Market card or, more rarely, to buy a victory card, in which case you’ll shuffle your discard pile into your deck. As an introduction to the key concept of deckbuilding—when you acquire a card you’ll get to play it again and again during the rest of the game—The Tea Dragon Society works extremely well, even for children way under the game’s recommended age of 10+. As a beautiful and non-aggressive path through several key deckbuilding decisions, the game also works for experienced gamers. I like the game enough I’ll mention a couple things that improve it. Misprints: There were different misprints in a couple editions. The first printing mistakenly said that the Book card gets discarded when you draw Entertaining. Actually, the Book should be discarded when you draw Boring. The reprint fixed the Book card but left numbers off of three other cards. Wind Chime should have 0 Growth and cost 3. Musical Instrument should have 0 Growth. The Bed with a missing cost costs either 3 or 4, whichever isn’t in the set already. I understand that Renegade's customer service is taking care of replacing cards for people who got misprints. I just wrote on my Book instead of contacting the company, but I know some people prefer official fixes. Tweaking the balance: We've had a problem with the card-drawing Items (Bed, Brush, Fruit, and Musical Instrument) that seemed too effective compared to the rest of the Market cards. Turns out that I hadn't read the rules well enough and missed the important rule that card effects only get used once a turn. These four cards are still probably the best cards in the game. They might still benefit from a 2-point cost increase, or limit each player to buying only one of the two copies of each BBFM card. My wife Lisa likes the idea of avoiding a type of deckbuilding dominance that feels wrong for this game by forbidding players from owning both copies of a specific BBFM card. You bought Fruit once? You don’t get to buy the other copy. More memories coming: The words in the wind are that the designers are working on a new stand-alone Tea Dragon Society set that can be combined with the existing cards! *Since I was taking a photo of the cutest game I played last year, I put the two other Cutest Things of 2018 on top of the box. The Deluxe Metal Meeples are from a Campaign Coins Kickstarter, and are now available from their store. The little one-eyeball monster is a Timid Monster I picked up at GenCon. I like 'em. “Sometimes bad things happen to bad entities” is an apt slogan for Wrestlenomicon! The first two gods into the ring are Hastur (picture above, standing) and Cthulhu (picture above, splatted). We’re starting the Kickstarter on March 5th with the decks for those two gods as the core game. After initial design and playtesting, I was too excited about this game to let it lie fallow while the production details were being wrangled into place by Arc Dream Publishing. 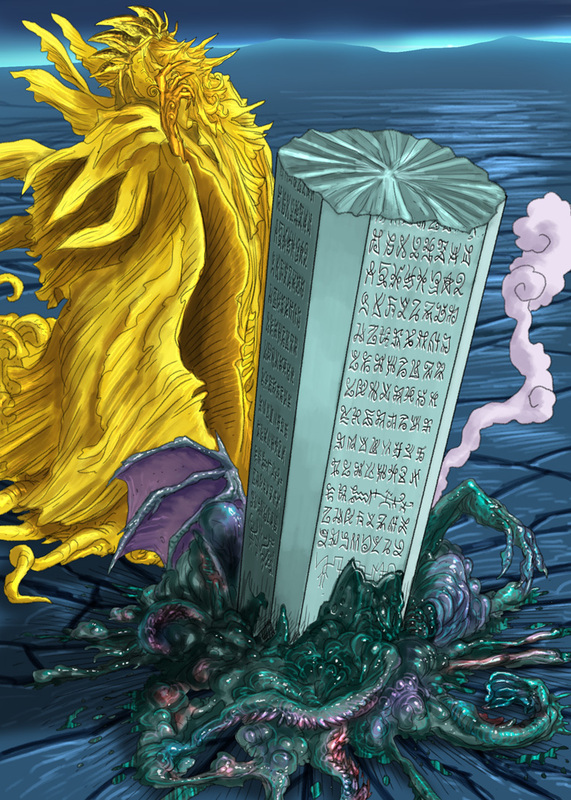 I went ahead and designed the Nyarlathotep deck and am working on Yog-Sothoth. If the Kickstarter community gets behind the game and stretches it into something powerful, we’ll end up with multiplayer rules and a full royal rumble of elder gods! A few early links . . .
For some notes on mechanics that I wrote during an early playtest phase, see this blog. Here’s Bebo’s GLOWing intro video. And here’s a look at an early version of the layout for the Sometimes Bad Things . . . card. (Among other things, the symbols will be a bit different in the final.) Layout artist Simeon Cogswell has been wrassling with the Kurt’s art to fit it onto our tarot-sized cards.